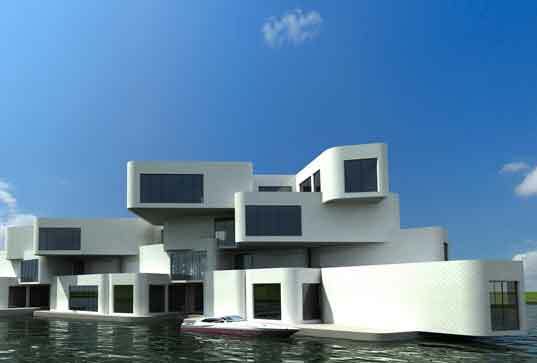 World's First Floating Apartment Complex to Begin Construction in 2014! 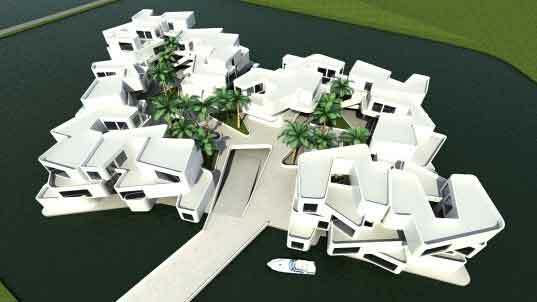 World’s First Floating Apartment Complex to Begin Construction in 2014! The Netherlands is home to over 3,500 polders, or patches of low-lying land that are protected by dykes. Since they are below sea level, water needs to be pumped out of these areas around the clock. The Citadel apartments will be one of six projects comprising the New Water development, which is located in one of these polders. After completion, the land will be flooded to allow the Citadel to float atop the water. The main deck will consist of a floating, heavy concrete base measuring 240 x 420 x 9 feet that will support the lightweight apartments and a parking lot. Each unit will be wrapped in aluminum and topped with a green roof. A bridge will connect the Citadel to the mainland and allow access for emergency and maintenance vehicles. Once water is reintroduced to the polder, the entire complex will float atop six feet of water. Inside the Citadel, each unit boasts a private outdoor space, a berth for a small boat, and greenhouses will be scattered among the units. Water will be pumped through submerged pipes to cool the structures. The overall design is estimated to make the apartments 25% more energy efficient than developments on land. Due to its size, residents will not be able to detect the motion of the water. Waterstudio is planning to begin building early next year, and progress will be documented through the Citadel’s official website. For centuries, the Dutch have manipulated the landscape to move water away from their dwellings. Instead of battling the elements, Netherlands-based firm Waterstudio just announced plans to construct the world's first floating apartment complex in 2014! The Citadel will offer 60 luxury apartments made from 180 modular units that will be arranged around a central courtyard and topped with green roofs.